After a successful tenure as an entomology professor and researcher at the University of Hawaii, Manoa, Marshall W. Johnson added a 10-year capstone to his career as UC Cooperative Extension specialist and research entomologist in the Department of Entomology at UC Riverside, based at the UC Kearney Agricultural Research and Extension Center. He retired at the end of June. Johnson traces his interest in insects to a visit with a family friend on the outskirts of his hometown, Roanake, Va., when he was 10 years old. He was intrigued by a copy of “A Golden Guide to Familiar American Insects,” and the friend gave it to him. “That’s how I got started,” Johnson said. He never looked back. Johnson earned bachelor’s and master’s degrees in entomology at North Carolina State University and in 1974 completed a Ph.D. in entomology at UC Riverside. After conducting short stints of entomological research at two locations on the mainland, he moved to Hawaii in 1983 to serve as a professor and focus his research on biological control. In Hawaii watermelon production, Johnson was able to help farmers reduce pesticide use by 90 percent by showing that pesticide applications were killing natural enemies of a Liriomyza leafminer pest they were trying to control. He also worked on biological control of pests on cucumbers, tomatoes, green onions, pineapple, papaya and coffee. In 1995, Johnson took a six-month sabbatical leave to UC Davis and realized how much he missed living on the mainland. He started looking for a new job and eventually was offered the combined extension and research position at his alma mater, UC Riverside, based at the off-campus research center in Parlier, Calif.
Johnson’s arrival coincided with the introduction of olive fruit fly in California, a serious pest that has devastated olive production in the Mediterranean region for more than 2,000 years. Olive fruit fly was detected in Los Angeles in 1998, and by 1999 had made its way into the San Joaquin Valley, the leading producer of the state’s olives. 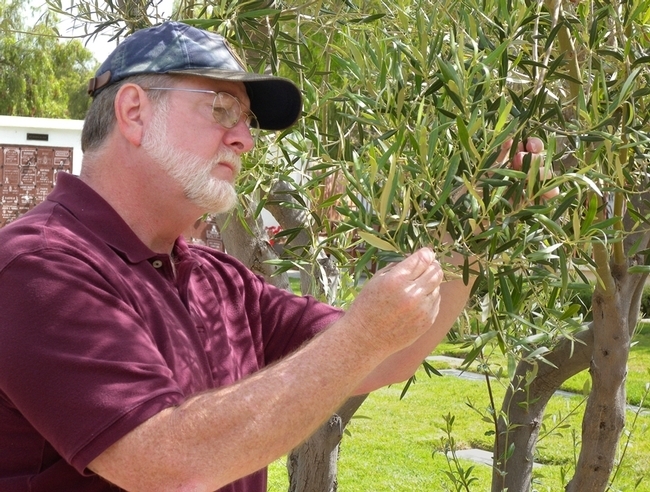 To the great relief of valley olive growers, Johnson and his biological control colleague Kent Daane, UCCE specialist in the Department of Environmental Science, Policy and Management at UC Berkeley, found that hot summertime temperatures in the valley depress olive fly populations. But that didn’t provide a statewide solution. Johnson and Daane worked together to introduce exotic natural enemies of the pest from Africa. The beneficial insects have been released from quarantine and introduced at several locations in California, with recovery of one species in the San Luis Obispo and Redwood City areas. Johnson was also involved in research that showed the Central Valley isn’t as hospitable to glassy-winged sharpshooters as other parts of the state. When it gets very cold, GWSS cannot move or feed. They either starve or get dehydrated. Johnson ended his career with a video production project designed to raise awareness about integrated pest management. Posted on the website Extending Orchard IPM Knowledge in California, the videos include interviews with IPM practitioners, researchers and farmers plus overviews of specific pest control techniques, such as biological control, cultural practices and pheromones. For his research and extension efforts, Johnson received numerous awards and honors over the years. Most recently, he was named “Distinguished Scientist of the Year,” by the International Organization for Biological Control. He is an elected fellow of both the Entomological Society of America and the American Association for the Advancement of Science. He was author or co-author of more than 200 peer-reviewed articles, book chapters, and extension publications. During retirement, Johnson plans to spend more time pursuing the art of photography, mainly landscapes and seascapes, which he captures during travels around the United States. Johnson also plans to continue cataloging the history of the family of his mother, whose maiden name was “Marshall.” He has already traced his lineage back to a 1729 immigrant from Ireland. An earlier ancestor, a member of the provincial council in Pennsylvania, was governor for one day when William Penn was absent from the colony, Johnson said.